Welcome to Grameenphone 1GB Internet 16TK offer. All Grameenphone customers can enjoy this Supper offer. 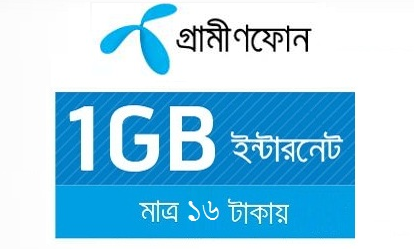 Grameenphone 1GB Internet 16TK offer Validity 7 days. GP customers can active this offer 1 time from 1 connection. • Dial *121*3*4*1# to active this offer. • All GP customers can use this GP 1 GB internet from 12 am to 10 am. • Dial *121*1*2# To Check Data remaining volume. • If customers can deactivate this offer. First, go to message option, write “STOP” and send SMS to 5000 (charge free). • This 1GB Internet offer will run till additional notice. Thanks for staying with us and visiting Grameenphone 1GB Internet 16TK Offer article. If you have any confusion about GP 1 GB @ 16 TK Offer, Just comment the box. We reply as soon as possible. Get Update All Grameenphone internet bonus, Grameenphone internet offer, Grameenphone bonus check, Grameenphone 3g internet bonus, Grameenphone internet package for smartphone, Grameenphone FREE internet offer every day technewssouces.